In the admin Control Panel, in the File section, would be very useful to copy a direct link to the file, so I can make my own links in HTML by example, to directly download the file. How do I get this unique download link? You can see this link in edit of a file in administration (top right). Ok I found it. I generated the token. I found the unique download link, but when I copy the link and paste on the browser I get an "404 Page Not Found". 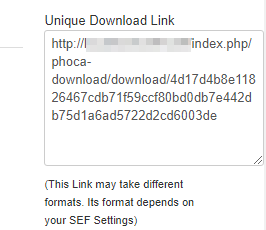 Is this a Phoca Download bug? I guess there is a bug, in the Unique Download Link generated, there are two slashes "//" like this "...//index.php...", if I remove one slash the download file page is shown, but when I click on the "Download" button I get and "Invalid token". Hi, the link should be created by your SEF settings, I will take a look at it. But there is no token to check whe you link to a file :idea. So, try to clear your browser cache and try to copy the link again (without the //). Do you still get the token problem? Can you paste a screenshot? Hmmm, what if you disable SEF on your site (for test only), copy the URL without SEF format, do you get the same problem then?